I'm a little bit in love with this set of images. I'm lucky enough to have friends and colleagues within the local photographer community who are willing to be guinea pigs for ideas I want to work out; in this case, the lovely Ashley of Applegum Photography let me monopolize her and baby Maddox for the morning. 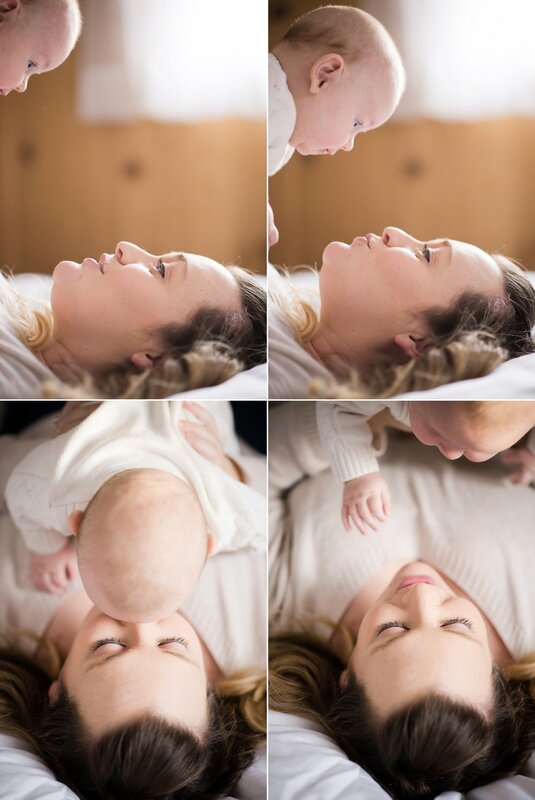 Mother+Child sessions are a real love of mine on any given day, and this particular set of portraits was designed to capture a specific bond in a specific way. My youngest child is just a few months older than Ashley's Maddox, and I just absolutely revel in his babyhood. I could eat it with a spoon. I love his plush cheeks, milky breath, and downy hair; the coos, the smiles, and even the squawks. And the cuddles. There is a palpable oxytocin rush when he intentionally leans his face into mine for kisses, or nuzzles into my neck, or reaches out to touch my cheek. HEART MELTED. It got me to thinking that I really wanted to design a session that could document this particularly sweet paragraph in the chapter of the mama-baby story. I wanted images that look like the moments feel. And if that makes any sense to you, well, I just may be the photographer for you. :) All kidding aside, I really do think every mama deserves to have such a beautiful portrait of her love for her baby. There really is no more powerful thing.